Special note: This was Capcom's first ever game for the N64! I had really high hopes for the game because I was a huge fan of Tetris (especially Tetris DX on the GBC) and because this was actually Capcom's first ever N64 title and they have been well known for their great games in the past like the Mega Man and Resident Evil series for example. How good is Magical Tetris Challenge? 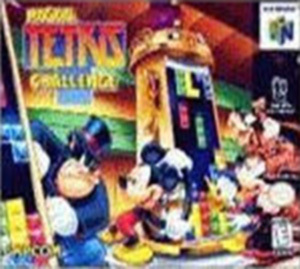 Well, not only is this another Tetris game we don't need (H2o's The New Tetris was released later in that year on the N64 by the way and it was far better than this) but you can tell that Capcom really didn't place a lot of effort in this one despite having both the Disney and Tetris licenses here. The game has three different modes: Story, Endless, and Versus. The story mode lets you pick from Mickey Mouse, Donald Duck, Goofy, and Minnie Mouse on a 6 level adventure. Endless is the old fashion 'play till you lose' type of game for a high score but it's just sad getting the high score in this game because there is no way you can save it (not even to a GamePak). The Versus game can be fun your fighting somebody as good as yourself but it's only a two player game so the rest of your friends have to sit out. MTC (Magical Tetris Challenge) also adds something new to the classic game; now there are several new pieces that fall from the top of the screen. The new pieces range from huge 5x5 blocks to new triangle shapes which are cool at first because now you can now get rid of five lines (Pentris) instead of four (Tetris). The new pieces may seem like a great idea at first but you they can also get in the way if you're not careful and create a lot of annoying gaps. The 2D graphics are fairly lackluster and it looks like a Super Nintendo game, not like the usual N64 game (not a single polygon or special effect to be found) but in the story scenes the game does have some nice backgrounds and the character animation is fairly well done (it's a Disney game so it better be). Hardly groundbreaking and poor use of the N64's advanced hardware overall. One thing a noticed right off the bat is that the characters DON'T have their trademark voices and catch phases like Goofy's 'Gosh' or Mickey's 'Oh Boy!' which makes me wonder if Capcom either didn't have enough money to buy the right to use them or they just got lazy. The music was good for the cute look of the game but it's still quite forgettable. Maybe this game is good as a quick rental for kids or anybody else whose curious about the about Tetris game on the N64 but since there's no battery save or gamepak options, what's the point of playing if you can't even keep your high scores!? Magical Tetris Challenge may have been passable in 1990 or something but in this day and age we need more than just cute graphics and novelty game play to be fully entertained. Magical Tetris Challenge is a crude piece of software.